I may have slightly accidentally bought a new sewing machine. My Quilt Expression 4.2 was due (overdue, really) for her second service last month, so I dutifully packed her into the back of the car and took her on the road trip to Carmarthen. 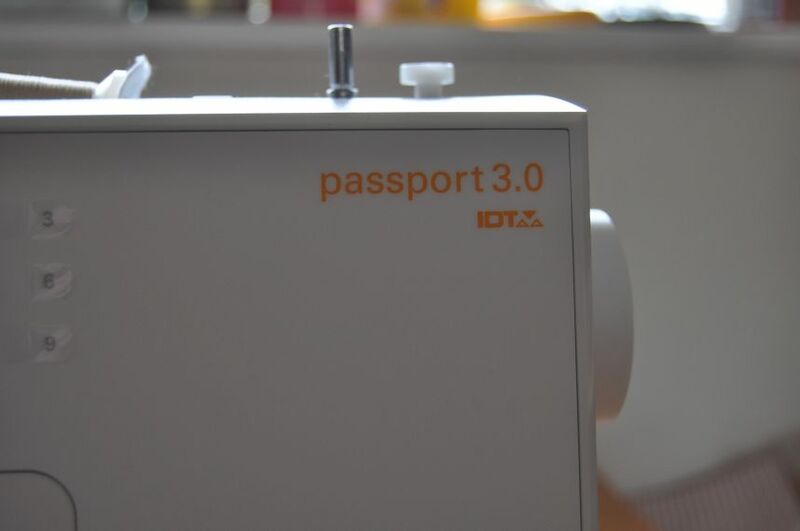 While there, I cast a wandering eye around the shop (which is usually packed to the rafters with assorted makes and models of sewing machine) and lit upon the dainty form of a Pfaff Passport 2.0. 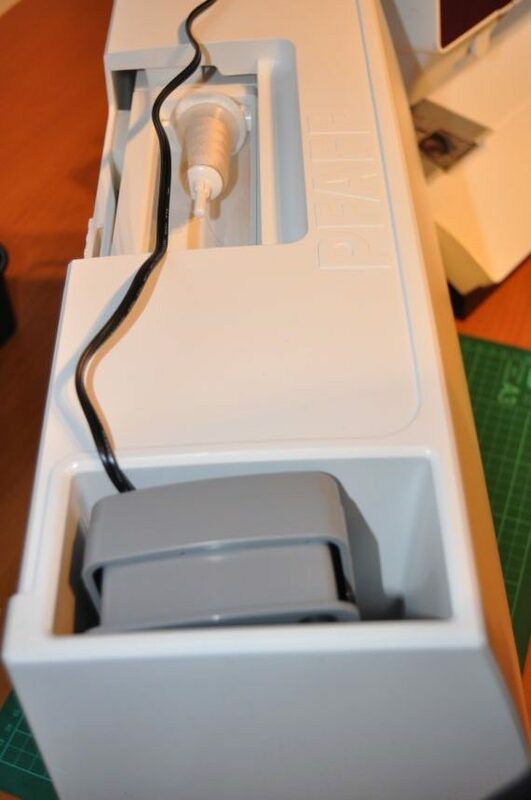 It’s a model I’d seen there before, and I had been intrigued by the notion of a portable sewing machine that still had the integrated IDT system and build quality of my larger Pfaff. 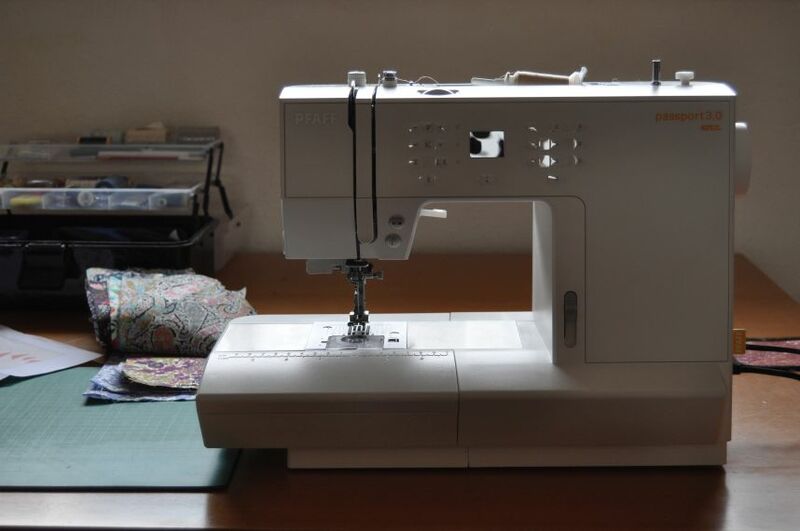 Recently I have been battling with a lot of lower back pain, so a smaller, lighter machine to carry to Quilt Club and to have set up for piecing duties at home, while the 4.2 handles the larger piecing and quilting jobs, was not a new or unwelcome idea. I’ve also always slightly suspected that the QE4.2 does not really appreciate having her considerable personage lugged about hither and yon like a piece of cargo, although she bears it nobly. Seeing my interest, the shop owner (not being daft!) encouraged me to have a play, and also mentioned that he had a newer Passport 3.0 available as well. I had to have a play with that, too! 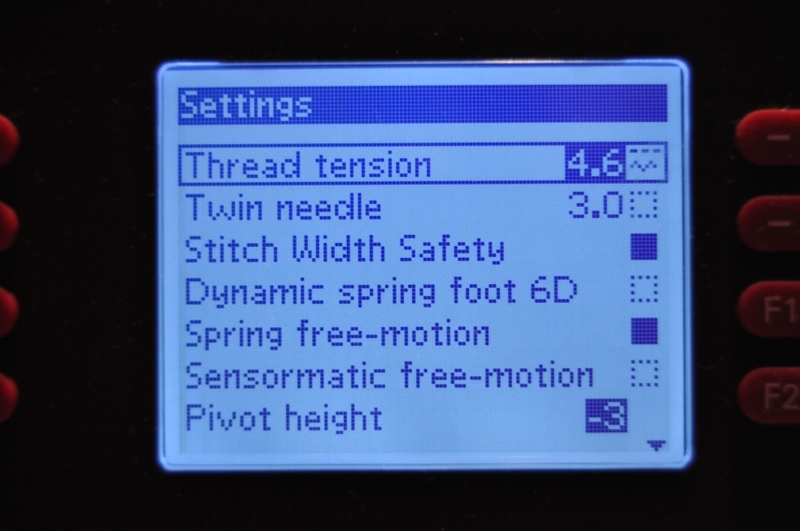 The main differences between the 2.0 and the 3.0 are mainly down to the stitch library (the 3.0 has about 20 more pre-programmed stitches) and an auto thread-cutter (2.0 doesn’t have this, 3.0 does). Otherwise they’re pretty similar in layout. The price difference? Thanks to a deal from the shop owner, about £50. Another advantage is that most of the feet I have for the QE4.2 will also fit on the Passport (with the exception of the FMQ feet because it’s a different system). Built to travel with a hard case and a slot for the pedal and cables! I pottered around town while the QE4.2 had her service. I came back to the sewing machine shop. I had a bit more of a play. Mum met up with me and we went for tea to discuss the idea. 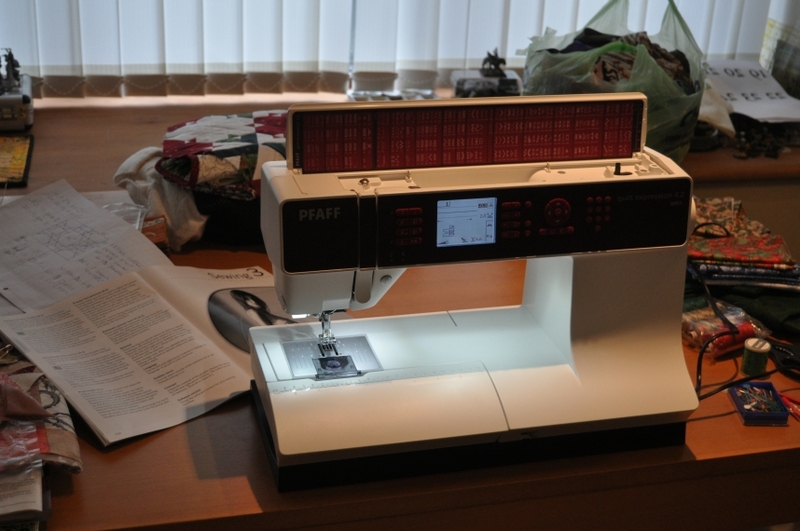 One does not spend several hundred quid on a new sewing machine without some deliberation first! Was it a sensible purchase? Would I get enough use from it? In the end, the fact that I had recently received a little more money from my great aunt’s estate, which happened to be about the same as the cost of the machine, was the clincher. Also the fact that, personally, 2017 has had a rough start and godsdammit it’d be nice to have something nice and spoily. So, thank you VERY much, auntie Hillary! 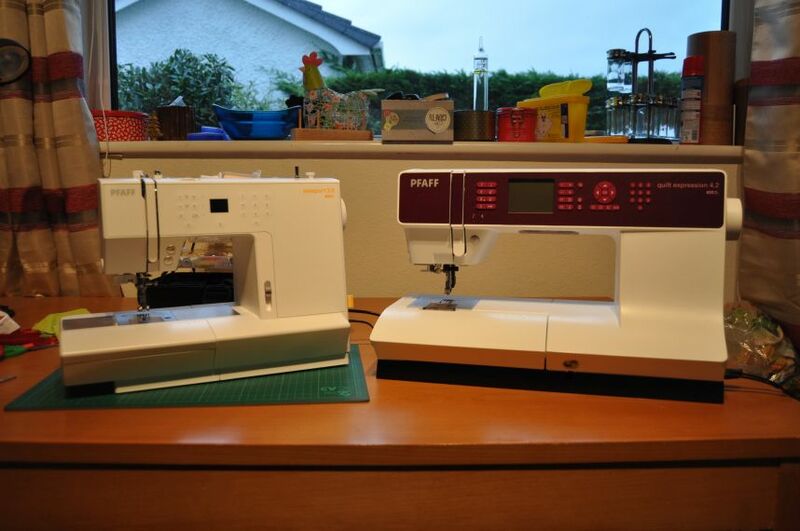 I now have two sewing machines to remember you by. I think you might approve of that. Sisters by a different mister? Big Pfaff in Little Pfaffing? Pfaff and Pfaffability? …Ok, I’ll stop now! 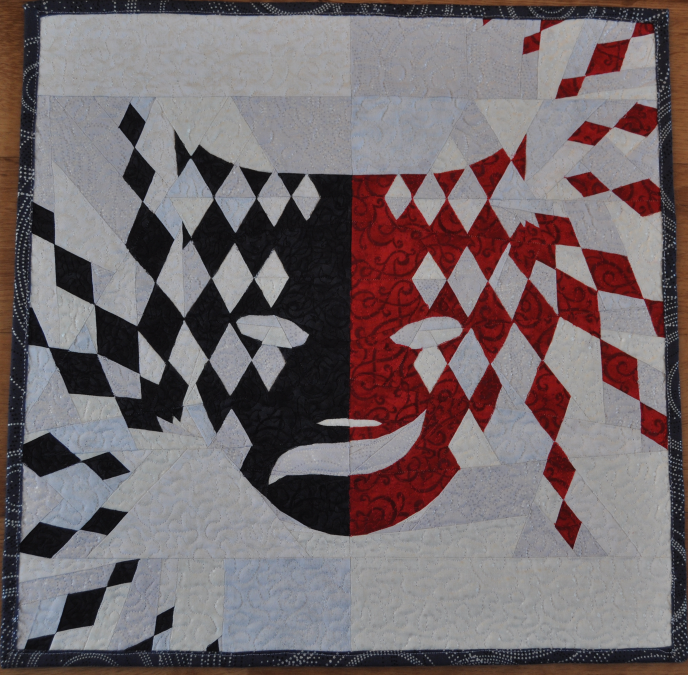 I could maybe have been a lil more creative with the quilting, but in the end I kept things fairly simple, with sharp stippling in red and back on the masks and smooth stippling on all the background areas. 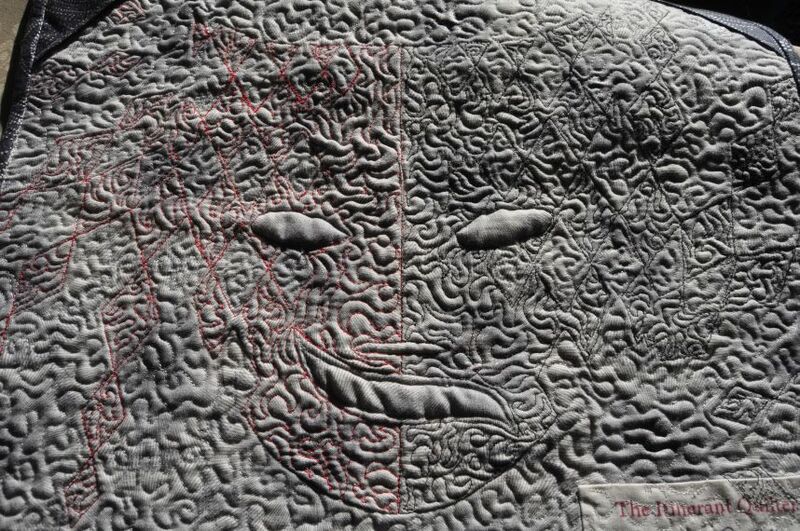 The eyes and mouth were left largely unquilted because I liked the way that looked. 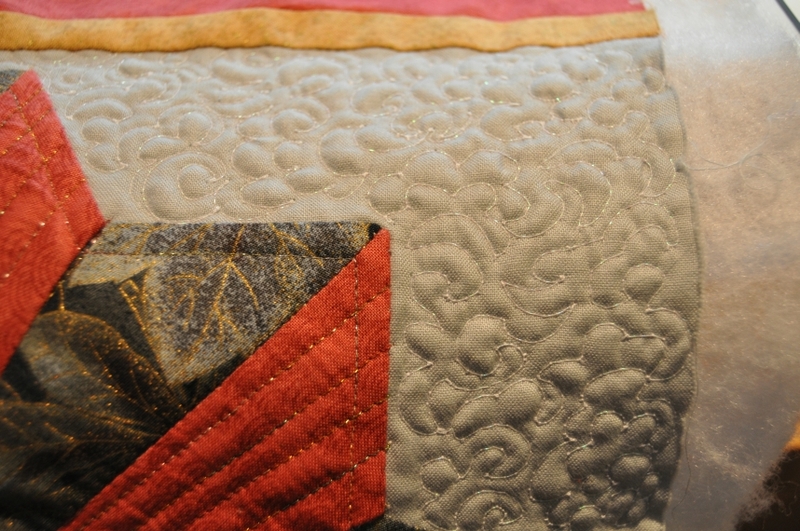 All the quilting was done by using the 6D spring foot with Guettermann Sulky rayon thread, a 80/12 embroidery needle, a tension of 4.0 and a pivot height of -1. I didn’t have any skipped stitches (that I noticed) and very few thread breakages. 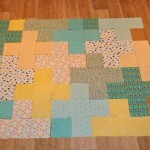 This was a HUGE improvement over the last time I tried quilting with rayon! This time, the thread behaved really well, even allowing me to thread-paint over some warbly spots where I’d wobbled off the line thanks to my not-amazing FMQ skills. Woo! When I look at my site stats, one thing always grabs my attention – the number of views of my post “Heaven or Hell? 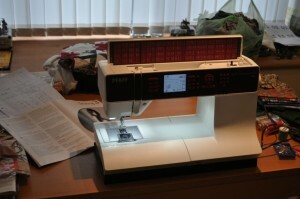 Thoughts on the Pfaff QE 4.2“. It is by far and away the most “popular” post on my blog! Even when I’m being lazy and not generating much new content, it’s the post that seems to attract clicks. I’m going to guess that it’s because many, like me, found their shiny, expensive, new sewing machine to be a bit of a challenge to get used to. Well, it does get better, I promise! It is a finicky machine, to be sure, but I’ll repeat here that choosing a quality needle (Schmetz seems to have become my weapon of choice, even if I do have to order them online) and good thread (I love YLI’s range of variegated quilting cottons because of the vibrant colours and I’ve also used and enjoyed Aurifil and Superior products) and making sure the needle is right for both the thread and the fabric is very important. I stopped trying to use universal-type needles for anything a long time ago – in my experience, they just never give a nice result. Usually I use a 70/10 microtex needle with YLI’s Soft Touch in Natural for piecing – this combination gives me nice, accurate seams and the light beige colour blends well with most other colours. 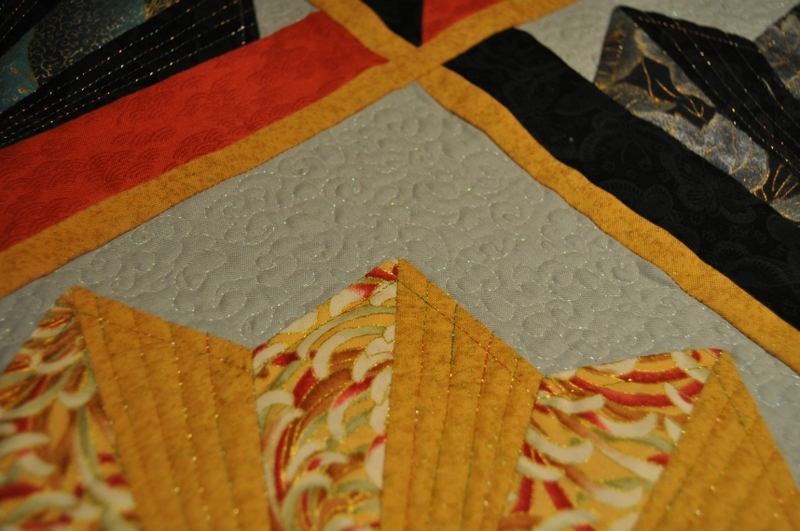 For quilting or embellishment, anything goes! 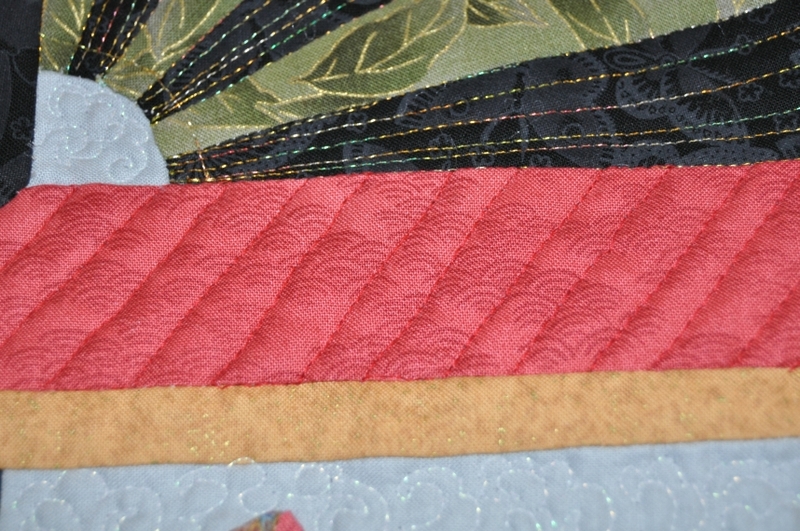 I switch to a heavier needle (usually a 90/14 quilting needle) to use with thicker quilting cottons or a metallic needle to quilt with metallic thread. I’m not OCD about changing needles every 8 hours, but I do change them regularly and especially before and after really big projects. 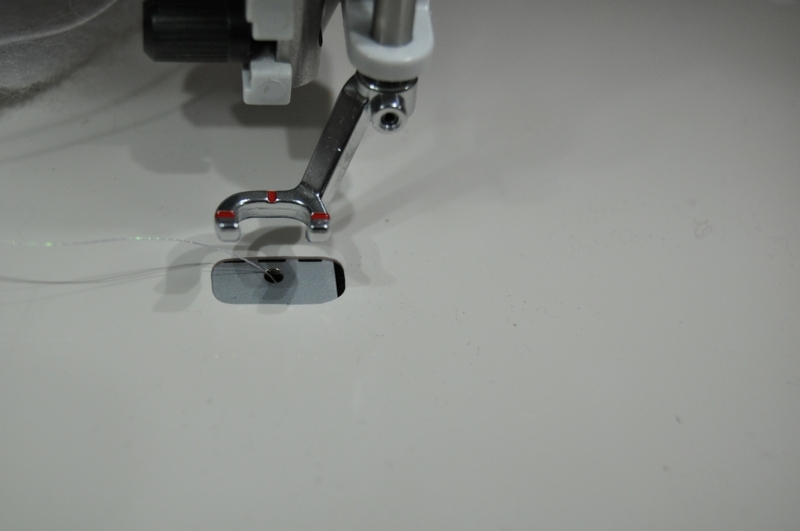 Regular servicing is also a must for any sewing machine. My Pfaff is now due for its second service, I just need to be able to steal the car for the (now rather longer and more tedious!) drive to Carmarthen to the shop I bought it from. When I take it in I’ll be asking about the needle threader, which vexingly is no longer lining up with the needle eye. It’s a small thing, and a feature I never thought much of before I had one, but I really miss it now! At least I can thread my own needles if I have to. Between services, I do my best to keep the bobbin area reasonably free of fluff. While I was making mum’s wall hanging, I found that the Solvy shredded little bits all over the place during sewing (as a film, it is noticeably more brittle than most fabrics), so I made sure I cleaned them out of my machine frequently – I’m not sure what it’d do if it dissolved inside the Pfaff, but I am very sure I don’t want to find out! At the same time, I managed to track down and evict an entire herd of dust bunnies that had wedged themselves into difficult niches and grown to monster size. I had to use tweezers to grab them and hoick them out of their nests, just poking them with the little brush really wasn’t doing it. Speaking of tweezers, recently I found myself performing a little “minor” surgery on my machine and it’s something worth checking. I was in the process of making this little HST quilt top for Project Linus – a super-speedy, fun little thing – except that it wasn’t speedy at all because I found that my needle was refusing to stay in the needle-holding assembly, no matter how many times I tried to re-seat it and tighten the screw. It was deeply annoying. 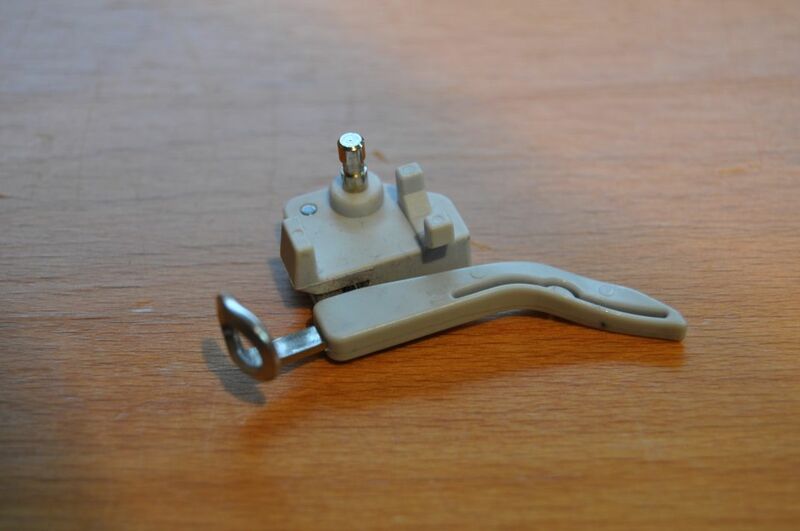 While fiddling about with it and cursing, I noticed the small screw at the back of the needle holder and observed that the whole assembly was very loose and rattly. 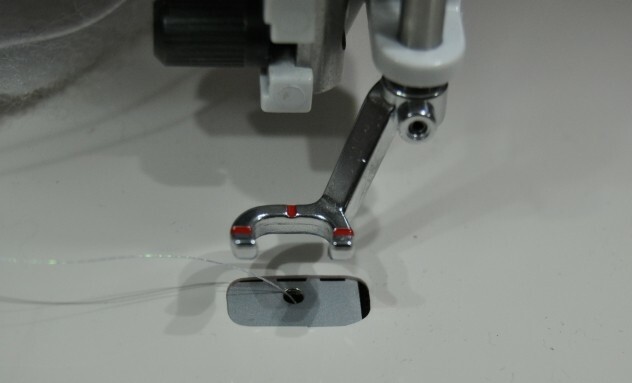 It’s also part of the thread path (that silvery hook affair at the base), so it’s an important little bit of kit and it occurred to me that it really shouldn’t be as wobbly as it was. Without really thinking about it, I undid the screw and the whole needle holder fell apart into a bewilderment of very tiny bits of metal. Whoops! Luckily, I didn’t lose any of it into the guts of the bobbin area, and after careful examination of the little bits and application of the afore-mentioned tweezers and a set of very small socket screwdrivers (I have a Thing about socket screwdrivers), I managed to reassemble it again and make sure that the rear screw holding it all together was tightened properly. To my vast relief, it would hold a needle again – PHEW! 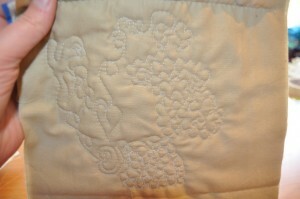 And in fact, the Pfaff is now sewing noticeably better since my impromptu tinkering. 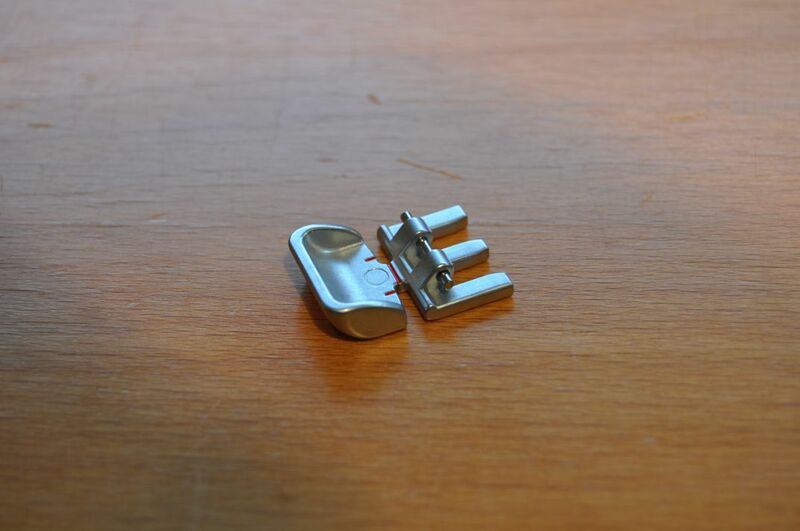 I definitely wouldn’t recommend randomly disassembling bits of your sewing machine without very good reason, but I would say that it’s worth checking that the needle-holder assembly isn’t really loose if your stitches are not looking as good as they might, given that it affects both the stability of your needle and the security of the thread path. If it’s hard to get at the screw, try moving the needle as far as possible to the right, so that the shaft is not right in line with the IDT system. 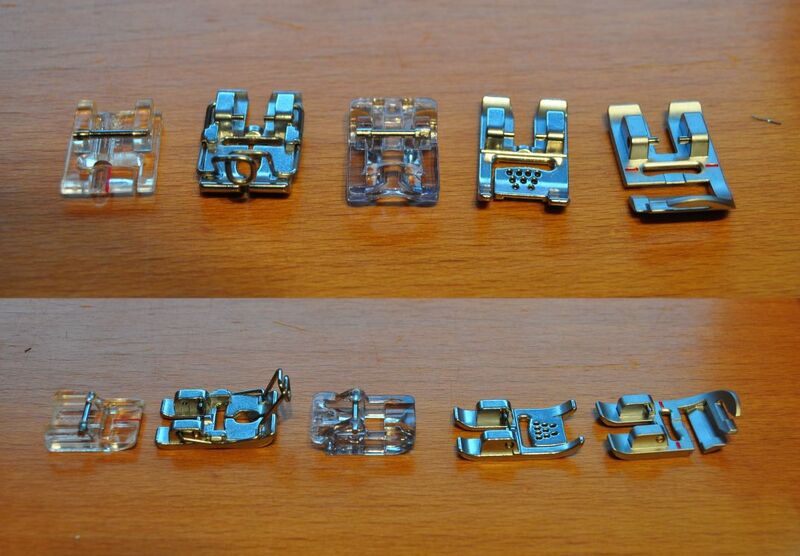 My collection of feet for the Pfaff keeps growing – it’s like a mechanical centipede! I got these five (L-R: piping foot, couching foot, beading foot, cording foot and braid foot) as a set in a very good deal when I was wrestling with the piping on the Shimmering Weekender for my sister. It was better than no piping foot, but I wasn’t convinced that it was up to the task of wrangling the sheer mass of fabric I was trying to feed through the machine. (you have to disable the IDT system to use it, unfortunately) So far, the only other foot I’ve used from this set has been the couching foot, and I’m keen to find an excuse to try the other three this year! 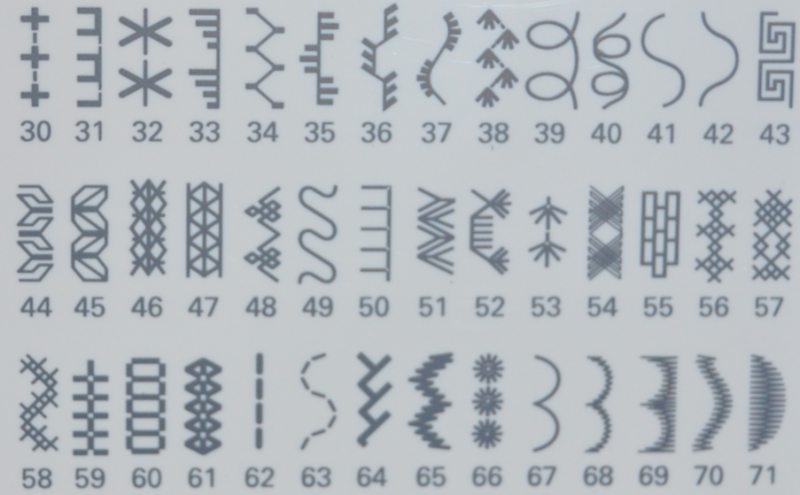 I already have some beaded trim – I need to find an unsuspecting project to put it on. 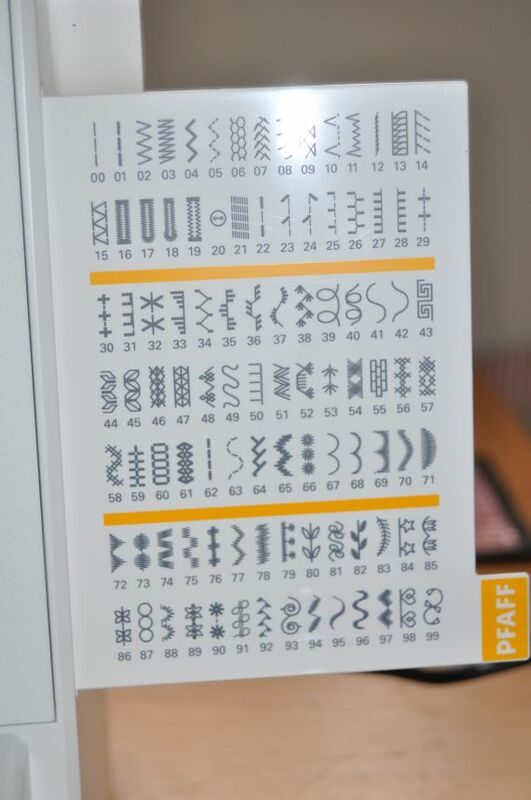 Given that I want to make a Weekender for myself at some point, I paid a visit to the Pfaff stand at the Festival of Quilts and asked for their advice after my difficulties with assembling my sister’s version. They recommended the grand piping foot as a better alternative to the little plastic standard piping foot. As you can see, it’s a much heftier beast, and can be used with the IDT system. Making myself a Weekender is something I really want to do this year – I will report my findings with this foot when I do! 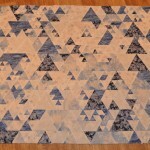 I have four variations on the theme of FMQ feet for the Pfaff, but this one has easily become my favourite. I held off from buying one for a while because I wanted to be absolutely sure that it would work with the Quilt Expression 4.2, but the ladies on the Pfaff stand assured me that it would, and it’s a purchase I have not regretted. So, March eh? It felt like it flew by at a million miles an hour, but at the same time it felt like forever. What’s with that? Skimming back over my posts for March, it seems like I’ve managed a lot this month, including making a birthday present, finishing a major project, playing with triangles and making progress with my Marsala Challenge quilt, so I’m pretty pleased with this month’s efforts. 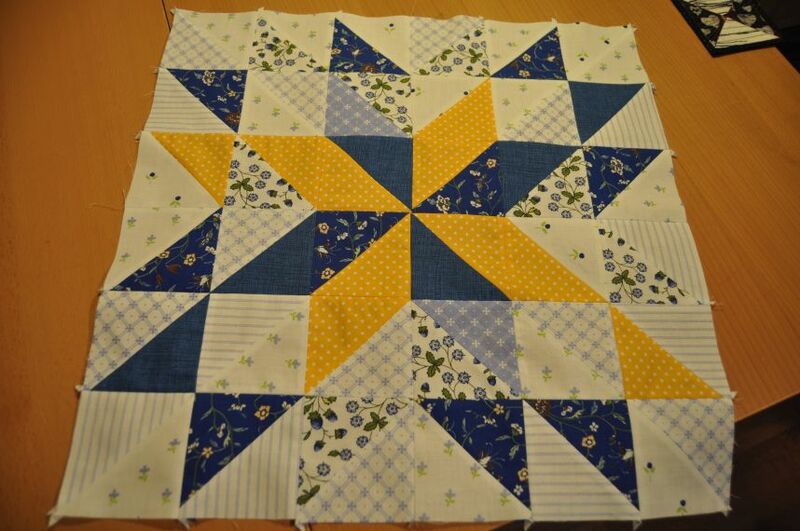 The weekend just gone is no exception when it comes to quilty busyness. 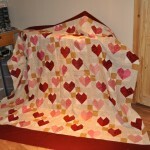 It started with Quilt Club on Friday, which I used as valuable piecing time to crack on with more Marsala Spice blocks. That project is finally taking shape and I now have a much better feel for where it’s going. We’re also still house-hunting, so after Quilt Club I threw everything plus dog back in the car and scooted up the road to Aberystwyth (Mum had already gone up on the bus), where we planned to stay at my sister’s house for a weekend of re-visiting some possible properties with my uncle and aunt, who’d come down from north Wales to meet us there and offer fresh eyes and second (third, fourth…) opinions. 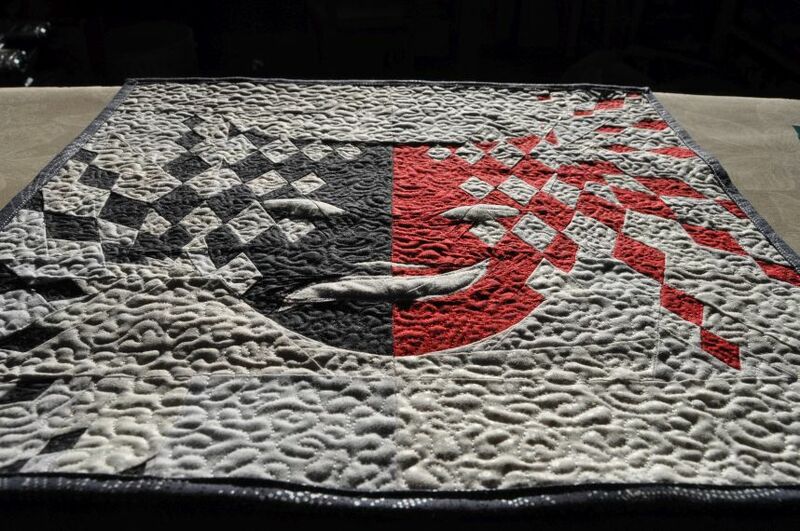 My aunt and uncle are recently back from an anniversary trip to Oregon, and before they went I’d rolled my eyes, batted my eyelashes and begged them to maybe pop into a quilting shop while they were there to buy me some fabric. For the sake of simplicity, I asked them to pick me up some pre-cut strips. Their choice, I told them. And I would be happy to reimburse them. And didn’t they do well? 😀 They bought me two as a very early birthday present, and I’m paying them back for the other two. I think they made some superb choices. Batiks! In case it wasn’t clear already, I LOVE batiks! 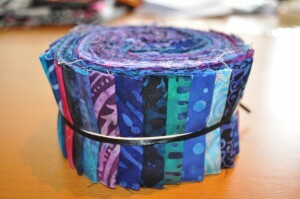 And the colours are fab – those purpley jewel tones and the juicy rainbow-y effect are just delicious. This is a much more floral affair, but I still rather like it – it’s got a very comfortable, graceful feel to it. Would make a lovely throw for the living room. 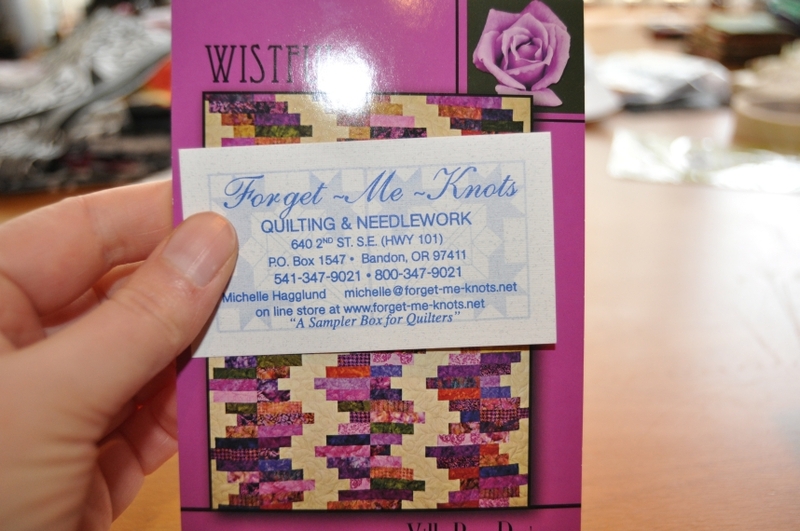 They also picked me up a nice little postcard pattern (the how-to is on the back), which I think is for the purple/jewel-tone batiks, though it would work with other colours too: And that’s the shop’s card there, too. One thing that did surprise me was the fact that the prices of the strips were, mostly, pretty comparable to what we pay here (~$45/£30), which is why in the end I only asked for a couple of extras. 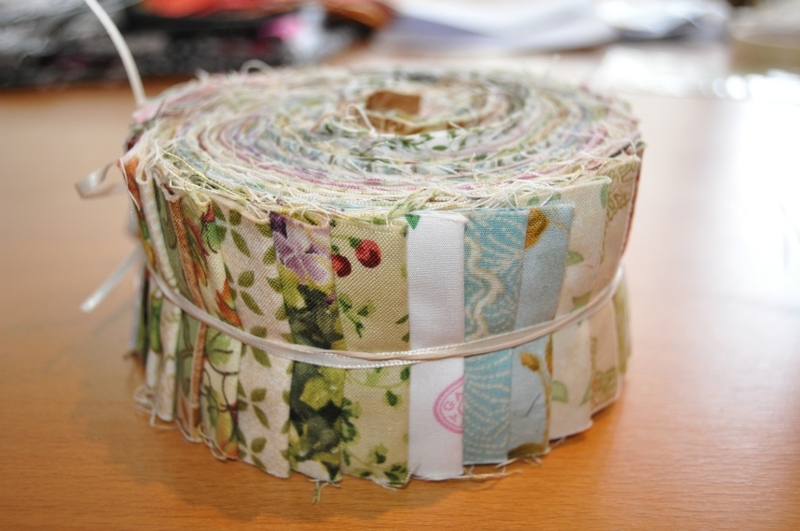 However, locally we’re pretty starved for fabric shops and those we do have don’t usually have much of a range of jelly rolls/strip sets, so just having some surprise extras to play with is really nice. 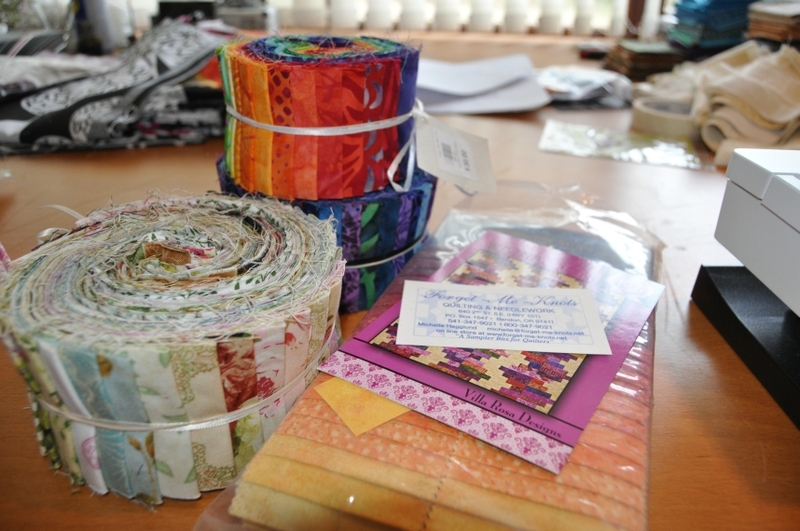 On Sunday evening, I and all my sewing stuff travelled up from Aberystwyth to Brimingham on the train. I’d booked myself onto a “Making Friends with your Pfaff” day through The Cotton Patch for Monday, and to be there on time I needed to stay over the night before. Thankfully, the carry case I bought for the Pfaff just about fitted it, so my machine had some decent protection from the abuses of public transport and I had some wheels to haul it around on. And I’d found a Premier Inn right up the road from where the course was being held, so it all worked really well. I found myself doing a version of my “cloud” stippling, mostly because I’ve just done loads of it on the Japan Fan Club door curtain and it’s still in my muscle memory, then I tried a bit of a meander and some leaves, plus some pebbling (I’m not great at pebbles yet). And it all worked great, and the back looks tidy too. Maybe I can learn to love (or perhaps even just like) the sensormatic foot after all. 🙂 It would be fair to say that I’d discovered or looked up a fair bit of what we covered in the class because I’ve been using my machine a fair bit since I got it in December, but there were certainly plenty of things that I hadn’t found out about or needed to use yet and it was great to try things out and have someone to ask when things didn’t work out quite right. After the course was over, I couldn’t resist nipping a couple of doors down the road to Cotton Patch’s shop. 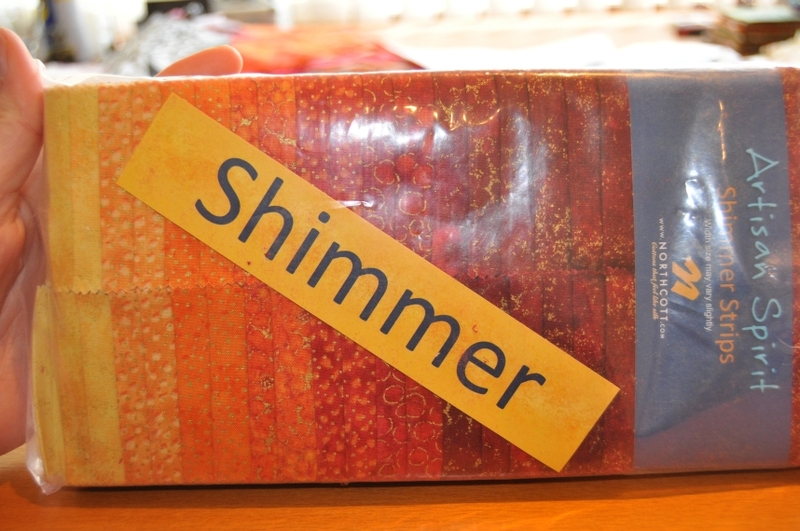 In any case, I had a shopping list from my Quilt Club friends, so I couldn’t disappoint them! 😉 The actual shop is smaller than I expected (I think they do more online), but very orderly and well laid out. I picked up stacks of wadding and some bobbin boxes for the Quilt Club, and some more crib-sized wadding and basting pins for me. Under the circumstances, I think I was VERY restrained! 😀 (In fairness I didn’t have that much time to browse, which was probably just as well.) One of the other ladies on the course very kindly offered me a lift to the station, which I was hugely grateful for given that I was laden down with all my sewing stuff AND all my purchases. All in all it was a tiring but fun trip, and I would certainly consider going back for another course there, especially if there’s something FMQ-related. I decided to experiment with the tension some more, dropping it from 4.6 to 4.2 and then to 3.8. Based on how the last few blocks look at that tension, I’d say 3.8 is a winner. There seemed to be no adverse effects on the back, either; I hate it when my thread grows tension legs! 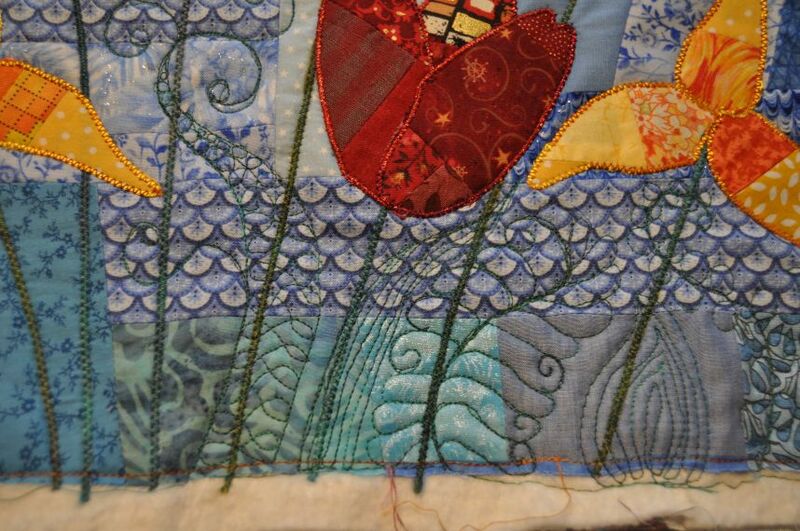 You can see (just about) that I’ve started doing some quilting on the red bits of the window frame. It’s essentially a squared off, slanted zig-zag between the two seam lines. 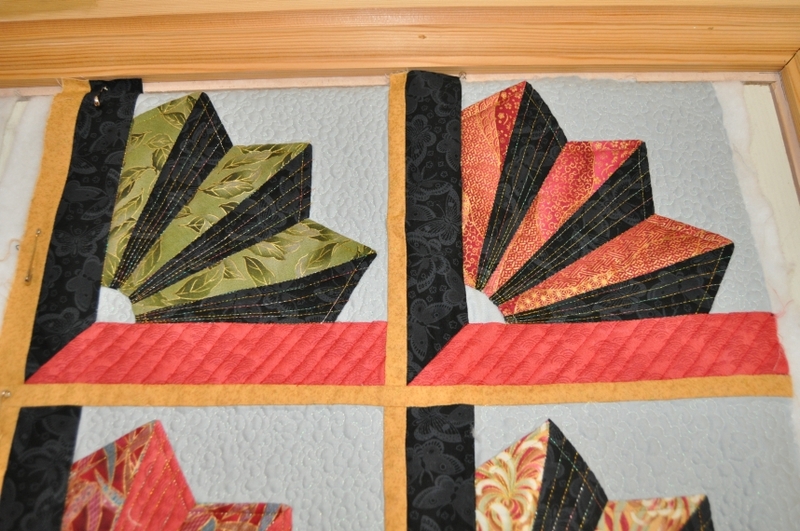 I’m doing these free-motion and finding that straight lines and FMQ is an uneasy combination! They’re quite wibbly. I started off completely free-hand, no marking at all, which worked but was slow because I had to juggle FMQ and figuring out if I was going in approximately the right direction. Then I remembered (and found!) my new water-erase fabric pen and decided to do some guidelines because I’m better at following a line. And then discovered that, even with a pen, I can’t draw a straight line! Not sure if that makes me feel better or worse about the not-straight FMQ lines. 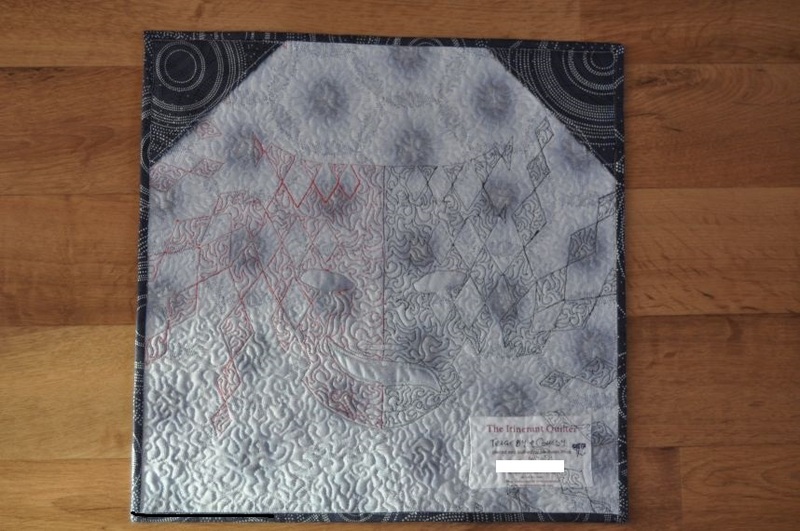 It has made the FMQ go a bit quicker, though, and I’ve found an angle to work at that I can manage fairly well in all necessary directions; initially I was rotating the quilt around the needle at every corner and it was doing horrible things to both quilt and needle. Despite the wobbles, I’m not going to start using a ruler or a walking foot for this – better if it’s ALL kind of wobbly and organic-looking rather than a mix of wobbly and machine-precise. I’m pretending it’s wood grain! Mum can’t see why I would want to do this free-motion rather than with a walking foot. 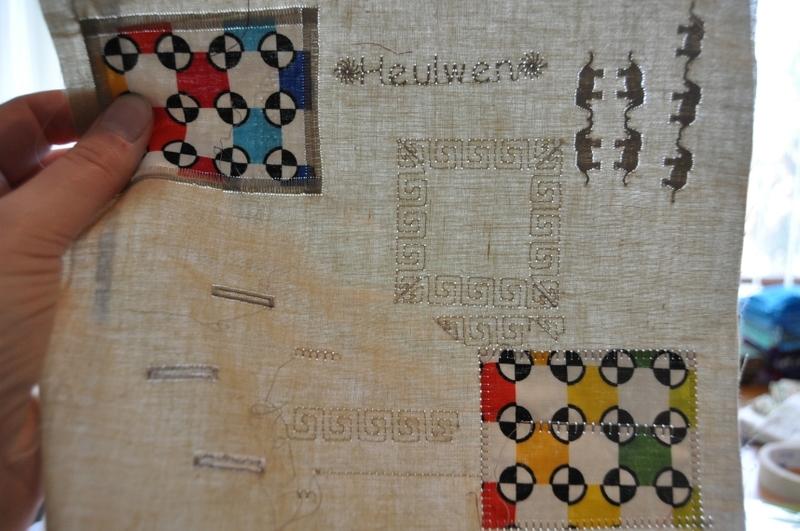 I tried and failed to explain the need for practice to achieve better control over the movement of the fabric and needle and thus better results in future. I admit, this doesn’t look as amazing as I’d like it to look, but I’m not going to get any better if I don’t do more of it. At this point, almost all the red on one curtain is done, my plan is to finish that off and then do the same on the black frames. 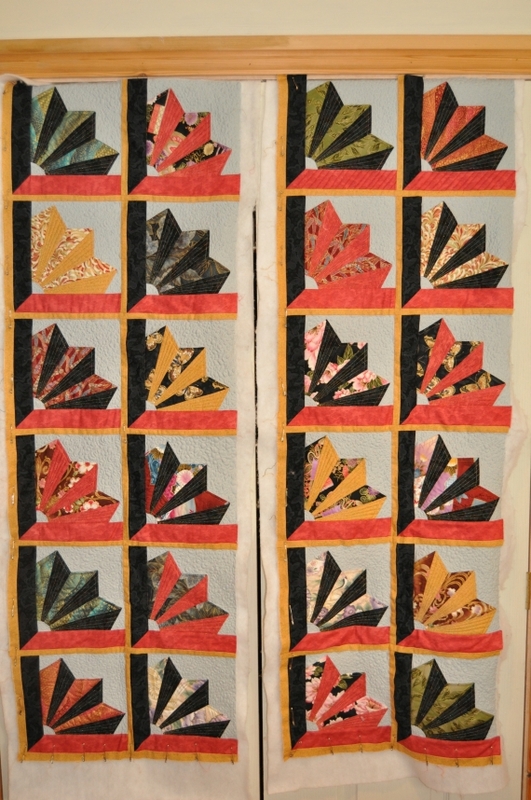 Then put the back and the hanging loops on, do some minimal in-the-ditch quilting around the frames to hold the whole lot together and it’ll be DONE! In time for Mother’s Day on Sunday! I can’t wait! 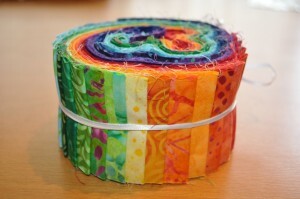 Linking up with Free Motion Mavericks, Let’s Bee Social at Sew Fresh Quilts and WIP Wednesday at Freshly Pieced! It sounds like the beginning of a dodgy pub joke, doesn’t it? Ahem. Anyway. 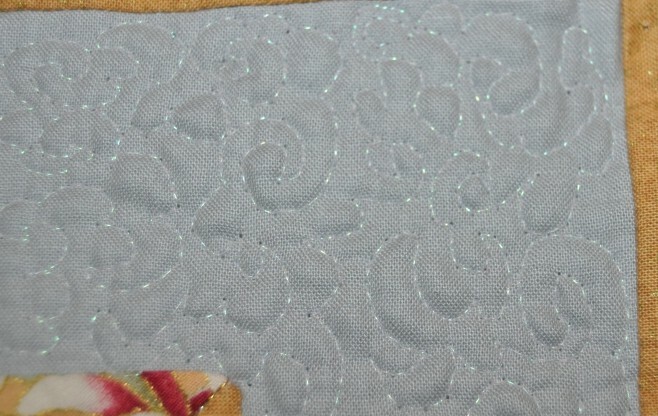 I am pleased to report that not only am I finally getting to grips with my FMQ demons, I’m doing so with metallic thread! And it is WORKING! I’m trying to do a sort of stipple effect that replicates that swirly, stylised cloud look often seen on oriental drawings and prints, with mixed success. Sometimes it comes out quite well, other times I get lost, trapped in a corner or my hands decide to move in a direction other than the one I had in mind. 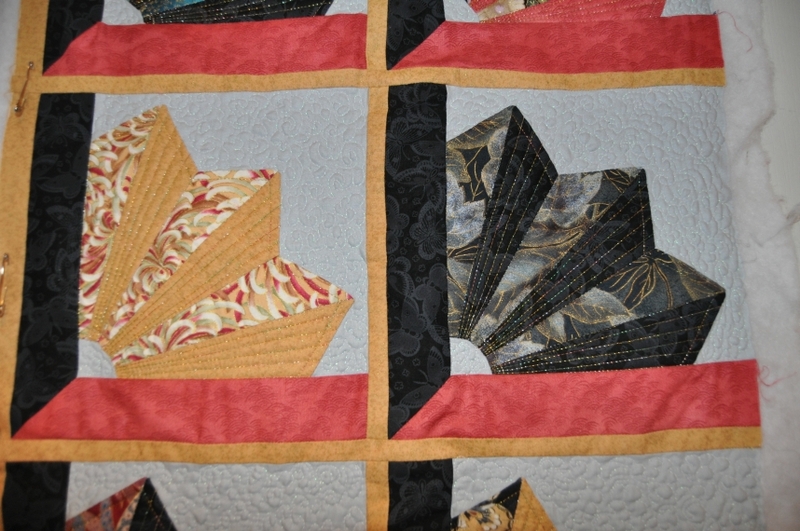 And I definitely have quilting density issues. However, at least I’m managing to do FMQ without lots of skipped stitches and broken thread, which is a MASSIVE win for me. 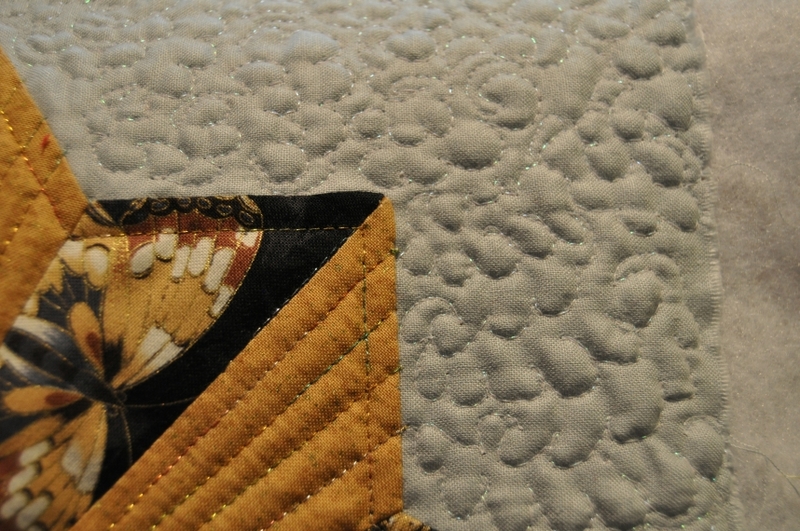 I have had the odd skipped stitch, true, but on the rare occasion it’s happened I’ve felt it was my fault for moving the quilt at the wrong moment rather than weird Pfaff-diva strop behaviour over a wrong thread/needle combo. 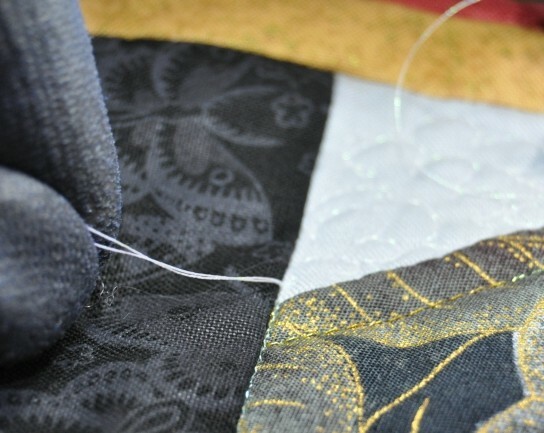 Initially, I started off by using white cotton piecing thread in the bobbin and my metallic thread on top in a vague effort to be a bit thrifty with my pricey speciality thread. It worked, ish, but the white thread made its presence known, especially at any point where I made a sudden change in direction and it was pulled through to the front by the top thread. You can easily see the build-up of white thread on the pointy bits. :s Not great. Despite fidgeting with pivot height, tension and even balance, I couldn’t eliminate this effect, so after doing (and arguably making a mess of) six blocks I tucked the whole lot away until I was in a mood to tackle it afresh. 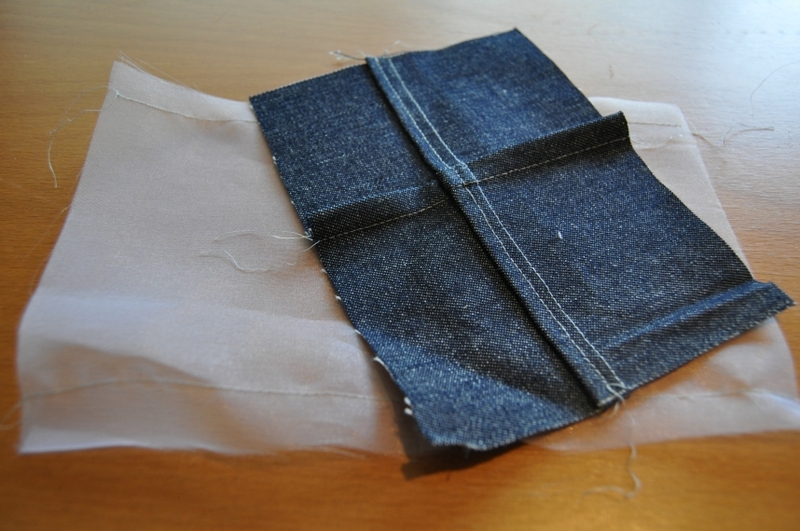 Feed dogs dropped, IDT system disengaged, and I’ve set up a personal stitch based on stitch 1 with the length set to 0 (because I found that if I used a pre-programmed stitch then the dratted thing kept resetting itself while I wasn’t looking) and no auto thread tie-off or cutting. I’m using the new FMQ foot that Pfaff brought out recently, which feels like it’s doing a more competent job than the wider plastic one. 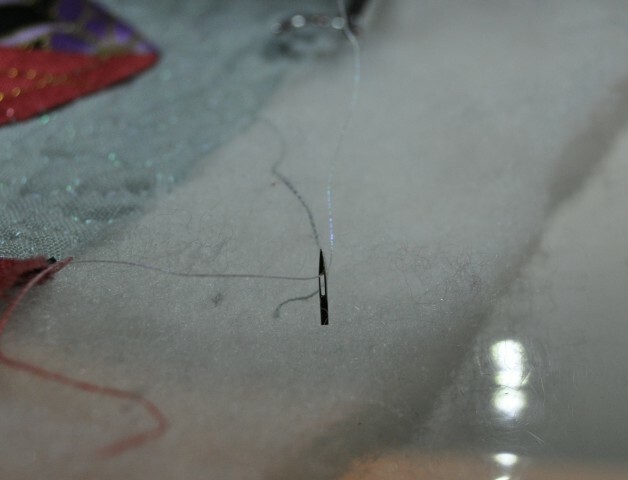 The needle I’m using is a Schmetz 80/12 metallic needle. 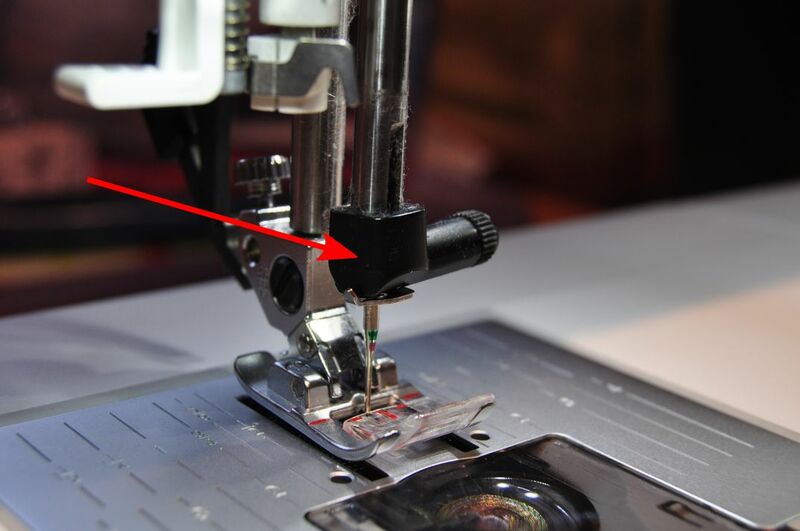 You can see that I’m also using a straight-stitch plate (and have the corresponding setting enabled in the tools menu on the machine), and a Supreme Slider. Oh, and I have a lil Teflon bobbin ring in there, too, that’s supposed to help stop thread nests. And my wonderful (and wonderfully cheap at a whole £1.50!) 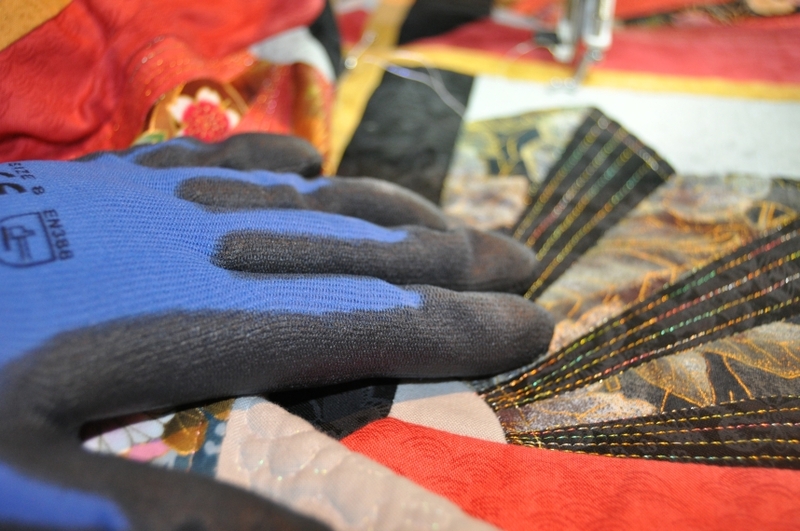 FMQ gloves, without which I cannot grip and move the fabric effectively. 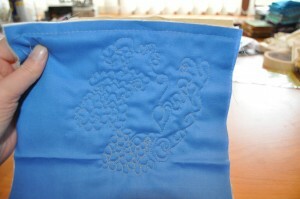 With metallic thread also in the bobbin, the look is better. I’m not convinced that the pull-through effect of the bobbin thread has been eliminated, though I think it is better with both threads the same. And at least it’s much harder to detect now everything’s the same colour! My muscle memory for the quilting pattern is improving the more I do it, though I’m finding that it’s quite an intensive process both mentally and physically, so I take little breaks often to loosen up. I think my machine’s bed is a bit high relative to my seat height, but there isn’t a vast amount I can do about it at the moment. This stuff is seriously sproingy. 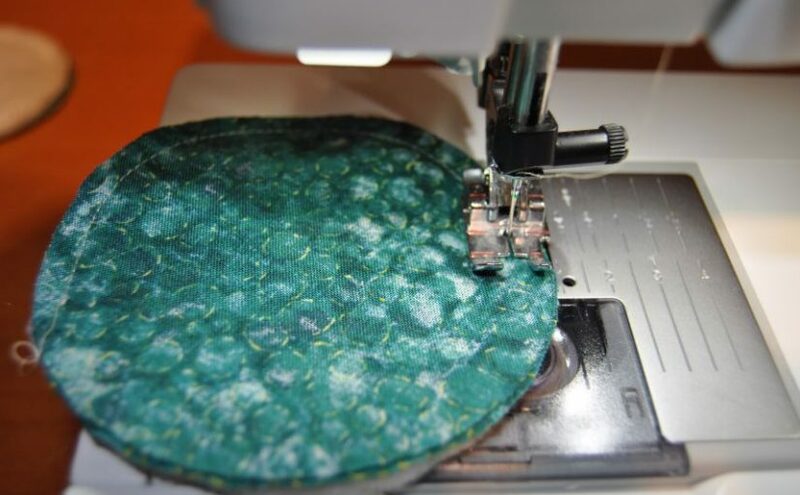 It honestly has a mind of its own, which makes it somewhat incompatible with the Pfaff’s built-in thread catching, tie-off and cutting features because of its irritating habit of coiling wilfully and never being in the right place at the right time. 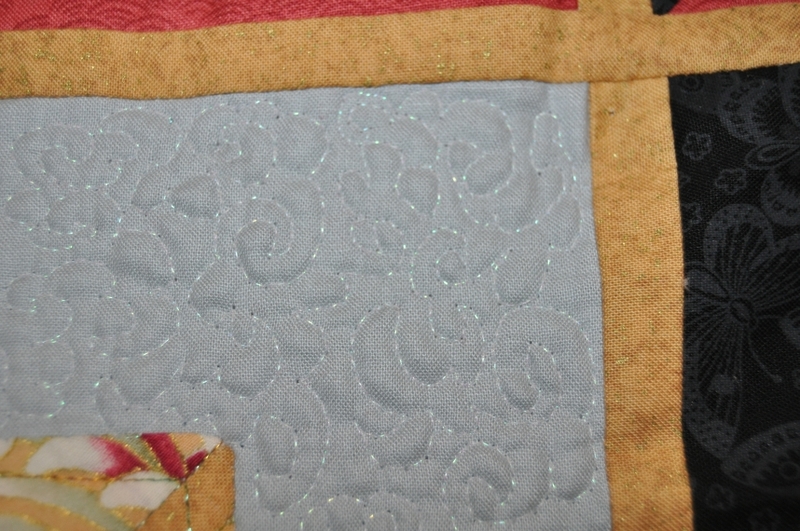 Metallic thread has taught me about the importance of bringing both threads to the top and securing them before starting to sew in earnest, since I’d already had trouble with the metallic straight-line quilting. It’s almost become second nature already. I think I was pulling the needle thread too tightly and when I tapped the pedal to drop the needle, it hit the stitch plate and snapped. I was furious with myself! The second needle is faring better though, and I’ve completely done one curtain and am almost half-way through quilting the second. WOO! Linking up to Free Motion Mavericks! Left: Top. Right: Bottom. Funnily, the bottom looks better. Well. Although I think there’s still room for improvement, the very brief trial of new foot + Guetermann thread was very encouraging. With the same thread in both needle and bobbin and an 80/12 needle, I dropped the feed dogs, took off the IDT, set the machine to the spring foot setting and the stitch length to 0 and doodled a little on a charm-square quilt sandwich. Immediately, I was pleased to note that the thread did not break and no stitches were skipped. WOO! No, seriously. That’s a BIG THING for me. The tension seemed off, however, and decreasing the tension bizarrely seemed to make the problem worse, not better. 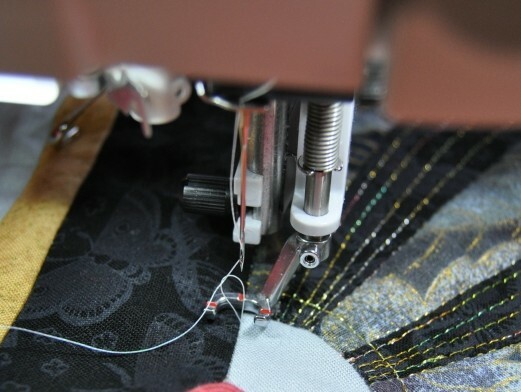 I could see big loops of bobbin thread being pulled up through the fabric during sewing and on tighter curves it looks like the top thread is pulled too tight, yanking the bobbin thread through the layers. Hrmmm. 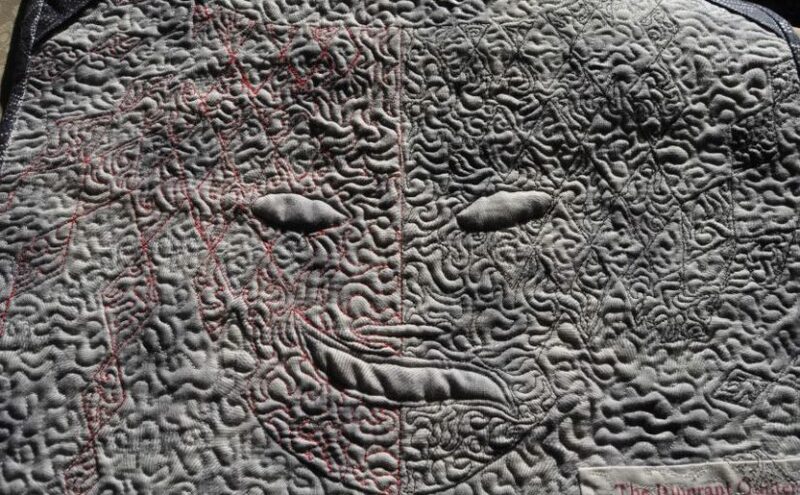 Ah, the Pfaff Quilt Expression 4.2. It’s a finicky beast, to be sure. I’ve owned mine now for a little over a month, and I’m on the fence as to whether it’s the best thing since sliced bread or a very expensive error. LOOK WHAT I BOUGHT! JUST LOOK AT IT! IT’S MINE! YOU CAN’T HAVE IT!